HYDRON® SE 230A is a water-based, single-phase cleaning agent specifically developed for the use in dip tank processes. 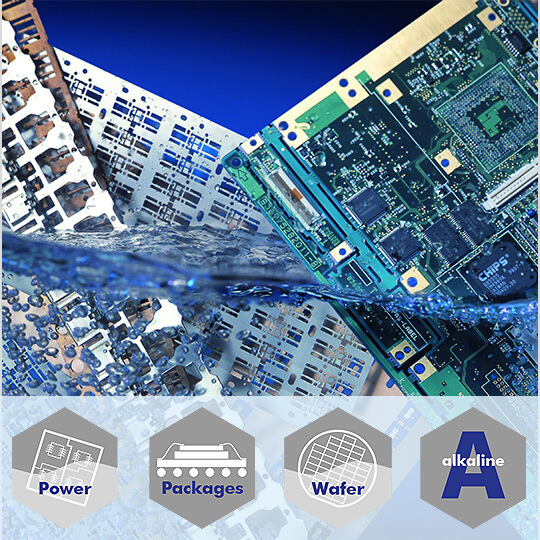 HYDRON® SE 230A reliably removes flux residues from all kind of semiconductor electronics, such as leadframes, discrete devices, power modules and power LEDs as well as flip chip or CMOS, i.e. after die attach. It provides excellent deoxidation of Cu substrates for subsequent processes such as wire bonding or molding. HYDRON® SE 230A provides stainless, activated copper surfaces for subsequent processes such as wire bonding, moulding and adhesive bonding and retains these activated surfaces over a temporary storage time. Due to its single-phase formulation, HYDRON® SE 230A can be easily processed and provides excellent performance in dip tank processes. HYDRON® SE 230A is also recommended for defluxing after wafer bumping in single-wafer processing equipment and centrifugal cleaning.